From the SF Chronicle: Berkeley: Backyard bounty feeds the hungry. In a region blessed with a year-round growing season and a plethora of orchards and backyard fruit trees, there is only so much of nature's largesse that can be pawned off on neighbors and co-workers. Luckily, there is Village Harvest, a suburban harvesting cooperative that last year picked and donated 84,000 pounds of fruit -- from cherries and oranges to grapefruit and persimmons - in Santa Clara County alone. Nearly half of it -- 44,193 pounds -- went to Second Harvest Food Bank of Santa Clara and San Mateo counties. Now Peninsula-based Village Harvest and a Berkeley nonprofit, Spiral Gardens Community Food Security Project, which wants to get more local produce to the poor, are piloting a harvesting program in Berkeley with the hope of expanding it to other East Bay communities. From the SF Chronicle: Energy strategy laid out / State trying to fight global warming, greenhouse gases. State regulators approved a far-reaching road map Thursday for California's energy future that tries to fight global warming by limiting greenhouse-gas emissions. The plan, approved by the California Public Utilities Commission, represents the state's latest attempt to balance economic growth with increasingly urgent environmental concerns. Some elements of the first action plan already have had an effect. In planning for California's future energy needs, the commission agreed in 2003 to a "loading order" -- the steps the state will take to meet growing power demand -- that placed greater emphasis on efficiency and the use of renewable resources than on building conventional electrical plants. The separation wall in Palestine does not give the Dove much hope. At least the US government seems to be registering the tiniest of objections to a blatant outrage: U.S. Challenges Fence Outside Jerusalem. The State Department registered its disapproval Wednesday of Israel's extension of a security fence into a large West Bank settlement near Jerusalem and called for the withdrawal of Israeli forces from several West Bank towns. Even as the Israeli pullout from Gaza and four West Bank settlements was nearing completion, the department made clear it would not delay its drive for Israel to deliver more territory for a prospective Palestinian state. "We would like the Sharm el-Sheik understandings fully implemented," said David Welch, head of the department's Near East bureau, who has made six trips to the region since he took over the post in March. Yes, the Dove is winding down. This summer I focused more on fiction writing; my kids' day care and school setups ended; and I prepared for graduate school. Posting got lighter and lighter. Now the day has arrived: I will be registering for classes tomorrow in the MFA in fiction program at Mills College. It's an enormous new venture, one that will require every bit of my reading and writing energy. All along I've maintained this blog as a separate venture from writing fiction. I live many lives as a writer - one entirely private, in hand written diaries; one private until ready for publication or workshopping; and this very public forum of the blog. As a blogger I've been reticent about my inner life. I do not let it all hang out here. Do you really care about my marriage and family? the details of my cancer treatment? This blog began out of my despair over the political news. Early on I posted essays addressing spiritual and psychological perspectives of the state of the world. Lately I've begun telling a bit about my travels and social life, just because the political comment was boring me to tears. I've hardly ever commented on the fiction I read (unless it has a Middle East connection) and I've never mentioned my fiction writing, including the short story which will appear in Natalie Handal's latest anthology of Arab-American writers. So this blog has not really been a literary blog. Meanwhile, the world continues to be a troubled and miserable place. Elmaz Abinader, director of the Mills English department and a fine writer, has written a play based on the Abu-Ghraib torture revelations. This is one way to respond to the nightmares of our current reality - write about it. I don't know if I have the guts to face this kind of material, as a writer or a blogger. We'll see where I go. Not sure how much I'll blog for the foreseeable future. There's always a little hope; this blog may be of use to others still, even if I don't actively maintain it. I'll keep the Typepad account, and I'm sure I won't be able to resist blogging a little. But expect light posting for the duration. I'm sorry to cut back - I loved the attention and feedback of a busy, active blog - but I don't feel like paying close attention to politics right now, and I do feel like plunging into grad school. So thanks for reading this blog for so long, and I'll see you around! I've written about Barenboim's East-West Diwan Orchestra before, but this latest go-round of the Arab-Israeli classical music summer fest is over the top: Haaretz - Israel News - All roads lead to Ramallah. Dozens of Israeli youngsters are traveling to Ramallah to play music, and young performers from Syria and Lebanon are crossing the border to join them, with permission from the upper echelons of national governments, including President Assad and PA Chairman Mahmoud Abbas. Thanks to Helena Cobban for the link. Thanks to rockslinga, we have a first review of Hope and Other Dangerous Pursuits, Laila Lalami's new collection of interlocked stories: Guest Review: Daniel Olivas. I can't wait to get my copy and start reading. Graduate school starts tomorrow but I'll find the time to read this long awaited book. Powell's Books in Portland, OR. It's a visual pun if you read Arabic. 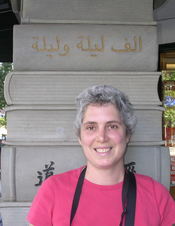 When I figure out how to upload pictures from my camera onto my in-laws' computer (if it can be done), I'll post a pic of me under the stone inscribed "Alf Layla wa Layla" on the pillar at Powell's Books in Portland. The inscription is in Arabic. I stopped to read it on my way into the store for the first time, and after spelling it out (I read like a second grader in Arabic) insisted that my husband take my picture under the word "Layla". It means literally "A thousand nights and a night"; you Westerners know it as 1001 nights; and yes the word "Layla" is the same as my name - which means night. So it was a visual and literary joke to stand under the sign. OK you had to be there. Hope the photo works out. Powell's makes me want to move to Portland. I've never seen anything like it - not the Strand in New York, not Cody's in Berkeley - maybe if you combined all the bookstores in Berkeley you'd start to approach Powell's. Amazing. We also liked Portland's trams, parks, the Northeast neighborhood of Hollywood, and McMeneman's Kennedy School, a restaurant, theater, bars and hotel in an old elementary school. I didn't get around to connecting with her, but the fabulous Moorish Girl lives in Portland, and will be reading from her new novel at Powell's on October 11. Stay tuned to Lailalalami.com for more info on Hope and Other Dangerous Pursuits. typepad isn't giving the usual buttons to create links so I'm having to log everything in by hand, sorry. More later. We're on an island in the straits of somewhere, off Seattle, having just eaten paella cooked on an outdoor fire. Unbelievable meal. Life up here is good. The indefatigable Alison sends along some news from the Ecological Society of North America about a project to restore marshlands in Iraq. "Surveying the region's ecology is, in some ways, the easy part. Since the rivers were diverted back into the area, the plants and animals seem to be returning with remarkable speed. The region has naturally low rainfall, and so relies on the yearly influx of spring meltwater that flows into the two mighty rivers from the Kurdistan mountains. From rough-and-ready species counts, numbers in the two marshy areas restored in phase one of the project seem to be comparable to or even higher than those in a marsh straddling the Iranian border, which was never dried out. But this is more than just a wetland conservation project. Iraq is one of the most politically turbulent countries in the world, and even just setting up a project involving Iraqi scientists working with US, Canadian, Italian and Japanese counterparts, as well as the United Nations Environment Programme, is a staggering achievement."